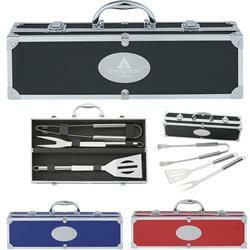 You want that sturdy grab and go custom bbq set with your logo laser engraved? 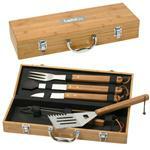 This is the barbecue set for you. Aluminum case with medallion to be laser engraved in the center. 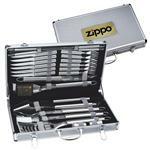 Includes: Spatula, Fork And Pair of Tongs and Meets FDA requirements. Easy Carry Handle And Double Clasps. 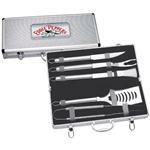 This is a great custom bbq set, affordable and built to last.